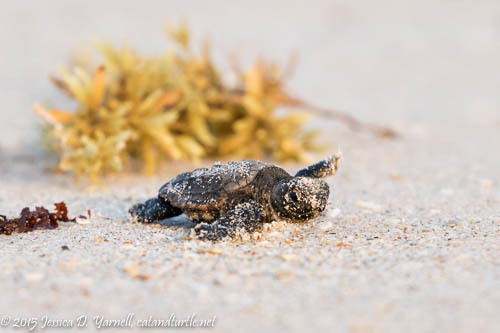 Blog > Beyond the Backyard > Archie Carr National Wildlife Refuge > Return to the Sea – Loggerhead Sea Turtle Hatchlings!! 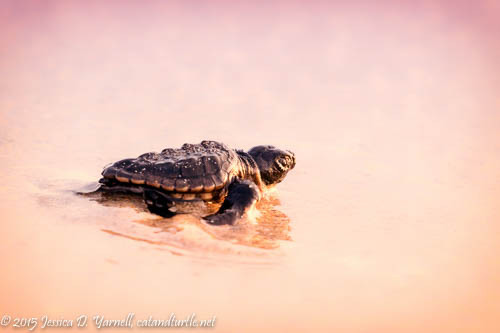 Return to the Sea – Loggerhead Sea Turtle Hatchlings!! 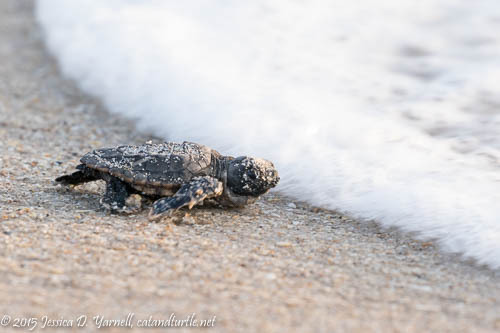 We interrupt the previously scheduled blog post to bring breaking news from the Archie Carr National Wildlife Refuge, where <gasp> Rich joined me for sunrise this morning and <woo hoo!> we saw a pair of hatchling Loggerhead Sea Turtles make their return to the sea!! 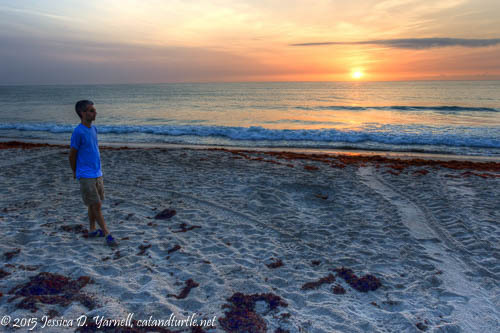 Rich on the Beach for Sunrise! The hatchings were tiny. And feisty! Rich commented that turtles are much tougher than my baby Sandhill Crane colts, who often collapse in the grass and rest while they run around after their long-legged parents. 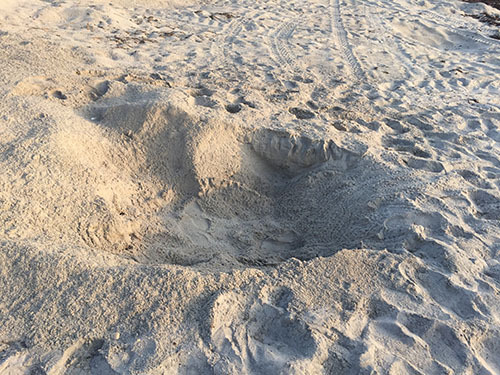 The turtles don’t have parents to watch out for them as they make the perilous journey down the beach. At any point, seagulls can swoop down and grab them, ghost crabs can eat them, or a dog running on the beach can kill them. 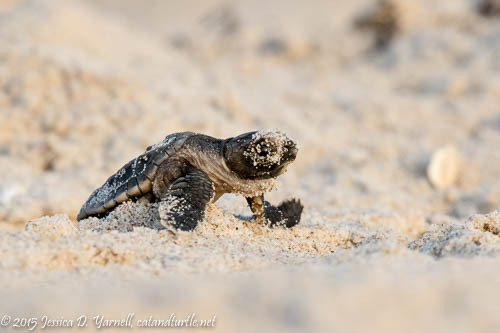 The hatchlings are tiny and defenseless and they have a will to make it to the ocean. It was incredible to watch. 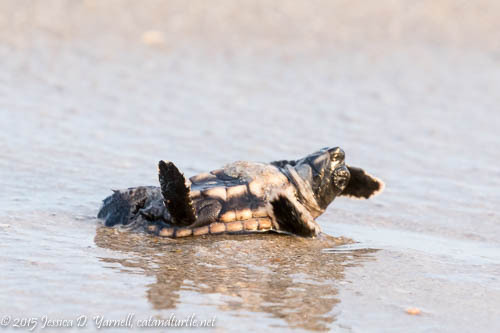 The first hatchling chose the biggest mound of seaweed to cross. He plowed fearlessly right through it, rather than trying to find a way around it. Here he emerged victorious and found the smooth path of sand wet by the waves. Once he was on flat sand, he was home free. Instinct guided him to make a run for the waves, and it was so cool to see him dive headfirst into the surf. Oops! The tiny turtle was swept up in the water and deposited farther up on the beach! He tried several more times to run into the waves and get himself swept up into Big Blue. The ocean wasn’t too welcoming. At one point, the waves deposited him upside down on the sand! He squirmed for a few moments until another wave caught him up and carried him out to sea. He’ll swim until he finds a clump of sargassum algae, which will become his home as he grows up. 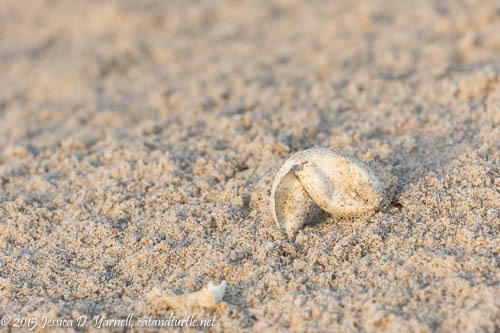 If “he” is actually a “she”, she’ll return someday to exact same beach to lay her own eggs. Other than brief intervals on land to lay eggs, the rest of her life will be spent at sea. After watching the first hatchling disappear into the waves, we headed back to the nest hole to watch the second hatchling. He wasn’t too sure how to climb out of that deep hole. First he tried one side, then he tried another, and finally he decided to just huff and puff and push himself out. It looked exhausting. Pretty soon all that was left on the beach were the empty shells of the turtles. After we left, I realized that I had been so focused on getting detailed images of the babies, that I had forgotten to “zoom back” and capture an image of the big picture. But Rich hadn’t. As the first baby made his run for the water, Rich pulled out his iPhone and took a video. 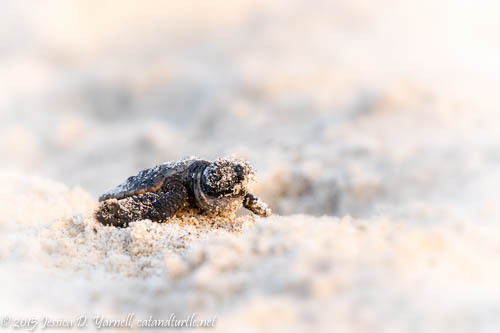 The perspective is so amazing with the tiny turtle bravely making his way home. How very cool! Certainly well worth the early wake up call and drive. Love the image of the one upside down and the determination of the one right below that image. What an amazing experience you had here Jess! I’ve seen turtles at night laying their eggs, but never the hatchlings returning to see, except under a controlled turtle release. Awesome! Very cool story and photos – thanks!